When I was a kid of about seven or eight, there was a question my sister and I started asking each other every Christmastime. It’s probably not the question you’re thinking of, but it’s a common one and the answer also happens to explain the mystery of the Colorado Kid. The question is simply this. “What’s better Christmas or Christmas Eve?” For me the answer was always easy… Christmas Eve. My guess is that it’s Stephen King’s answer too. 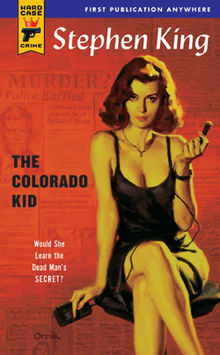 In his Afterward to the Hard Case Crime Novel, he almost comes right out and says that the reason the Colorado Kid has the ending it does is because he wants us to enjoy the process, the getting ready, the figuring things out, the guessing and looking for clues the way kids do on Christmas eve when they’re hoping for certain presents but not exactly sure what they’re getting. King of course goes one step further in the Colorado Kid. To make sure we appreciate the wishing and hoping and guessing etc, we find, on Christmas morning, that he’s taken away the whole tree and all the presents too… especially that biggest one we wanted most: THE SOLUTION TO THE STORY. Enjoy the process, he says, and just to make sure you do, I’m going to withhold a little bit… just a few details that would have allowed you to understand the Colorado Kid’s motivation and the actual details of his death. To help us understand what he’s doing and make it all a little more interesting, King frames the CK mystery with another mystery. This one is easy to solve. A very nice young woman (Stephanie McCann) who has a young man who probably wants to marry her very soon, has come to a little island off the coast of Maine to do an internship with a small local newspaper. Vince Teague, the 90-year-old guy running the paper and his 65-year-old partner, Dave Bowie, both like her and are considering offering her a full time job (maybe even more than that) at the paper. But before they do they want to see if she really has a sense and a passion for newspaper work and reporting. So they tell her about the biggest mystery that they’ve ever come across and as they explain it they try and find out if she’s up to the task. She is. There’s also the allegorical message which king spells out in his Afterward. Life’s a mystery, whether we want it to be or not. We live our whole lives with the uncertainty of where we came from and where we are going, no matter how solid our religious belief system or the lack thereof. So enjoy the mystery of it all… it’s what life is about. That still is not enough for you? Okay. In spite of warnings from both newspaperman Dave and Stephen King in his Afterward, I’ll emphasize one thing and tell you what I think happened to the Colorado kid. Here goes: James Cogan left his wife and suburban home and little son and went to his job at an ad agency in Denver. At around noon he left the building to get lunch and instead slipped into a limo he had hired to take him to Stapleton International airport. There he got onto a private plane and flew to Bangor Maine. He went to the town of Tinnock, ate fish and chips at Jan’s Warfside, and then took the last ferry to Moose-Lookit Island. He gave the boatman a cup of tea on the crossing. By then he had ditched his suit coat and his wallet and donned a yellow jacket. From then on no one saw him or knew where he was, but the next morning he turned up dead, propped up against a dumpster on the beach. He had choked to death on a piece of steak… a midnight snack. There was a pack of cigarettes on the nearby sand but only one cigarette was gone. The stamp on the bottom of the cigarette pack was from Colorado and this allowed the newspaper guys to trace his identity back to Colorado and find his wife. Oh, Cogan didn’t smoke. Oh, and the change in his pocket included seventeen dollars, some US change, and a Russian ten-ruble coin. Oh, and there is a possibility that a muscle relaxant added to the steak that he was eating could have caused him to choke to death… which would have made the death murder not accidental. Oh, and one more thing that I’ll be you missed: James “looked almost good enough to be the subject of one of those romantic poems by Mr. Poe.” His wife? Well, old man Vince says, “I was sort of expecting a pale and dark-haired beauty. What I got was a chubby redhead with a lot of freckles” (The old “good-looks disparity” motive.) You want to solve the puzzle? King says, “I could have provided half a dozen (endings) three good, two a-country fair, and one fine as paint.” How about this one? “Stephanie started back toward her own desk than something caught her eye on the wall length bulletin board at the far end of the room. She walked over for a closer look.” The left hand of the bulletin board was layered with old newspaper clippings. In the very bottom corner was a yellowed snippet from the Boston Globe. It simply read, Prominent Russian ballerina Elena Miskaya was found dead in her hotel room last night… apparent cause of death, choking on a small mouthful of chicken Kiev. Ms. Miskaya had been touring the US recently as part of an advertising campaign for the Moscow ballet. She was the wife of noted Russian chemist Vladimir Miskaya. Okay, the KGB-spy ending would have been better, but harder to explain.